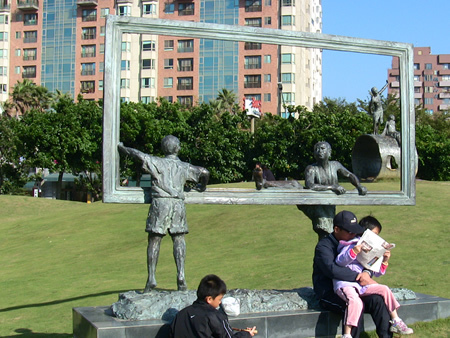 A couple of weeks ago Ben, Violet and I took a train and taxi ride out to Taichung to see the Fengle Sculpture Park (Fengle Diaosu Gongyuan) our guide book told us about (by the way, I don’t recommend this guide book). Anyway, a little internet research tells me (because the guidebook doesn’t!) 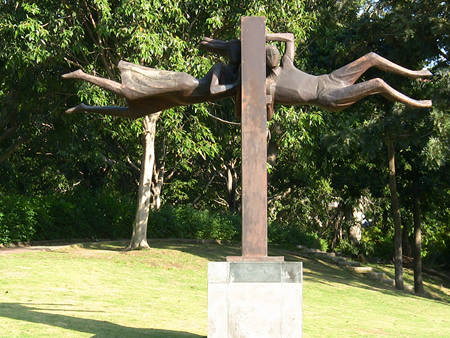 that this park was built in 1984 and it contains 52 sculptures. 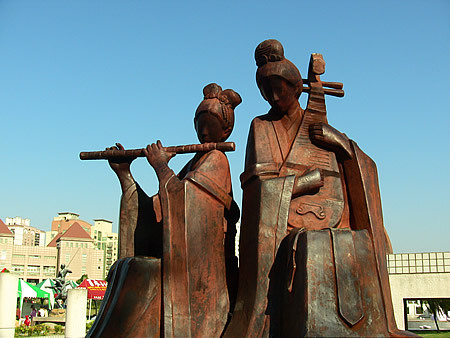 One site said the sculptures display the history of Taichung city. What an exercise for the imagination! It was beautiful, sunny, and windy the day we went to the park. Everyone seemed to be enjoying themselves. Kids were running around all over the place having fun flying kites, roller skating, and living it up on the playground. I was also having a lovely time until I was accosted by “the clothing police” at the nearby Cha Jie, or tea street. This woman, who was about my age, came up and scolded me for putting socks that were too short on Violet. At the time Violet had about an inch of skin showing between her pants and sock. I can’t help that there is a natural “hike up” that occurs when sitting in a Baby Bjorn! Perhaps we’ll put tights on under her clothes next time. Other than that, we had a great time in Taichung! Since Violet slept through our time in the park we didn’t really get any good pictures of her there. 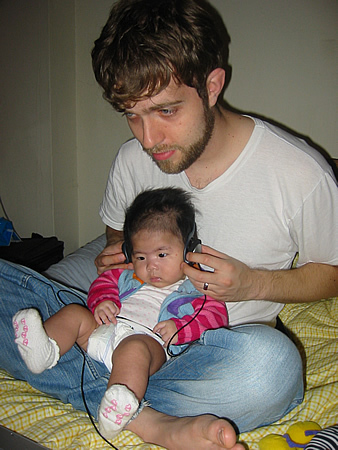 We threw in a picture of her listening to music with her dad. Hey! Remember me, I’m Kelly’s friend. I have been keeping up with you through the website and have loved your videos. Violet is sooo cute. Hope you had a great Christmas! 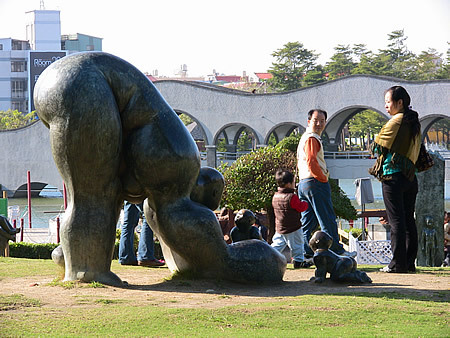 I enjoyed seeing the park. It’s cool to think that we will be there sometime next year, when we come to get our little one. Violet looks like she is growing and a happy girl, even if her socks are too short!